Hey everyone! 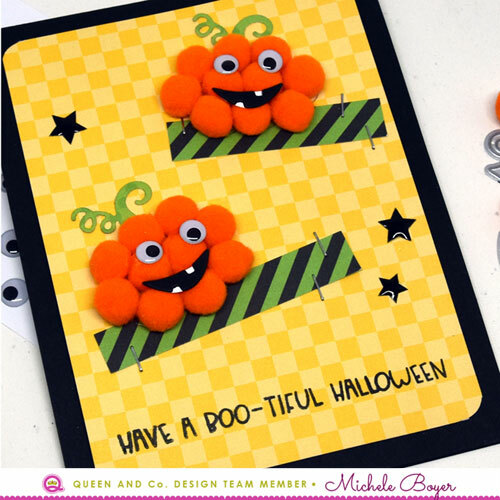 Today I’m sharing two more cards I created using Queen & Company’s super cute Monster Mash kit! (You can see the first two **HERE**.) While the kit is full of fun monster possibilities, today I focused more on Halloween. I first adhered two striped strips of patterned paper to a block of yellow paper, securing the ends with small staples. I adhered Gloobers in the shape of each pumpkin then adhered orange pompoms. I used the two layering dies to create the mouths, one die-cut from black, the other die-cut from white. The white piece was placed behind the black, allowing the white teeth to show. Sheer Glue holds the mouth and eyes in place. I added two die-cut stems, stamped the sentiment and adhered a few star shapes before securing the panel to a black card base. Next, I created a fun (quick and easy) bat card. I die-cut three bat shapes then die-cut and assembled three mouths. Once the eyes and mouths were adhered to the bodies (using Sheer Glue), I positioned the bats in place over the blue patterned paper. Using the bats as a guide, I wrapped white string, securing the ends on the back side. Once the string was in place, I adhered the bats, placing foam squares beneath the wings. I stamped the sentiment in white, white embossed then cut the strip into a flag shape and adhered. As a finishing touch, I added some black and white Epoxy Dots.